Visit the global Industrial "accident" archives for posts from all DGR sites. 173 towns in New York have passed a ban or moratorium on fracking. Nationwide in the U.S., some 364 communities have taken action. And the demonstrations in Balcombe, Sussex England will likely turn away fracking from Britain. Within the past decade, the combination of hydraulic fracturing with horizontal drilling has opened up shale deposits across the country and brought large-scale natural gas drilling to new regions, making profitable otherwise prohibitively expensive extraction. Fracking has already destroyed Barnhart, Texas, and more fracking is on its way – unless there is a successful resistance. Fracking involves much trucking in and out of machinery and disruption of life on the surface level of the land where many creatures live. Below the surface, fracking violently drills through land integrity to a depth most people can hardly imagine (6000-7000) feet – the size of a high mountain in reverse. Fracking introduces poisonous chemical agents into the earth and groundwater – which cycles back into the people and creatures who live in the area. It is also industrially intensive, with no long-term studies that prove its “safety” for future generations who live on the land. In fact, we are seeing both the poisoning of precious groundwater and the stealing of massive amounts of water itself for the industrial process of fracking. Technical Info: The fracking process occurs after a well has been drilled deeper than most people can imagine – 7000 feet, like a Sierra mountain in reverse. Steel pipe (casing) that has been inserted in the well bore is perforated within the target zones that contain oil or gas, so that when the fracturing fluid is injected into the well it flows through the perforations into the target zones. Eventually, the target formation will not be able to absorb the fluid as quickly as it is being injected. At this point, the pressure created causes the formation to crack or fracture. Once the fractures have been created, injection ceases and the fracturing fluids begin to flow back to the surface. Materials called proppants (e.g., usually sand or ceramic beads), which were injected as part of the frac fluid mixture, remain in the target formation to hold open the fractures. Typically, a mixture of water, propellants and chemicals is pumped into the rock or coal formation. There are, however, other ways to fracture wells. Sometimes fractures are created by injecting gases such as propane or nitrogen, and sometimes acidizing occurs simultaneously with fracturing. Acidizing involves pumping acid (usually hydrochloric acid), into the formation to dissolve some of the rock material to clean out pores and enable gas and fluid to flows more readily into the well. This is approximately the annual water consumption of 40 to 80 cities each with a population of 50,000. Fracture treatments in coalbed methane wells use from 50,000 to 350,000 gallons of water per well:http://www.epa.gov/safewater/uic/pdfs/hfresearchstudyfs.pdf, while deeper horizontal shale wells can use anywhere from 2 to 10 million gallons of water to fracture a single well:http://pubs.acs.org/doi/pdf/10.1021/es903811p The extraction of so much water for fracking has raised concerns about the ecological impacts to aquatic resources, as well as dewatering of drinking water aquifers: http://www.gosanangelo.com/news/2011/jun/25/one-scarce-resource-for-another-water-151-and-of/ It has been estimated that the transportation of a million gallons of water (fresh or waste water) requires 200 truck trips. Thus, not only does water used for hydraulic fracturing deplete fresh water supplies and impact aquatic habitat, the transportation of so much water also creates localized air quality, safety and road repair issues. In addition to large volumes of water, a variety of chemicals are used in hydraulic fracturing fluids. The oil and gas industry and trade groups are quick to point out that chemicals typically make up just 0.5 and 2.0% of the total volume of the fracturing fluid. When millions of gallons of water are being used, however, the amount of chemicals per fracking operation is very large. For example, a four million gallon fracturing operation would use from 80 to 330 tons of chemicals. As part of New York State’s Draft Supplemental Generic Environmental Impact Statement (SGEIS) related to Horizontal Drilling and High-Volume Hydraulic Fracturing in the Marcellus Shale, the Department of Environmental Conservation complied a list of chemicals and additives used during hydraulic fracturing. Many fracturing fluid chemicals are known to be toxic to humans and wildlife, and several are known to cause cancer. Potentially toxic substances include petroleum distillates such as kerosene and diesel fuel (which contain benzene, ethylbenzene, toluene, xylene, naphthalene and other chemicals); polycyclic aromatic hydrocarbons; methanol; formaldehyde; ethylene glycol; glycol ethers; hydrochloric acid; and sodium hydroxide. http://www.epa.gov/ogwdw/uic/pdfs/cbmstudy_attach_uic_ch04_hyd_frac_fluids.pdf Very small quantities of some fracking chemicals are capable of contaminating millions of gallons of water. According to the Environmental Working Group, petroleum-based products known as petroleum distillates such as kerosene (also known as hydrotreated light distillates, mineral spirits, and a petroleum distillate blends) are likely to contain benzene, a known human carcinogen that is toxic in water at levels greater than five parts per billion (or 0.005 parts per million). Other chemicals, such as 1,2-Dichloroethane are volatile organic compounds (VOCs). Volatile organic constituents have been shown to be present in fracturing fluid flowback wastes at levels that exceed drinking water standards. For example, testing of flowback samples from Pennsylvania have revealed concentrations of 1,2-Dichloroethane as high as 55.3 micrograms per liter, which is more than 10 times EPA’s Maximum Contaminant Level for 1,2-Dichloroethane in drinking water. When companies have an excess of unused hydraulic fracturing fluids, they either use them at another job or dispose of them. Some Material Safety Data Sheets (MSDSs) include information on disposal options for fracturing fluids and additives. The table below summarizes the disposal considerations that the company Schlumberger Technology Corp. (“Schlumberger”) includes in its MSDSs. As seen in the table, Schlumberger recommends that many fracturing fluid chemicals be disposed of at hazardous waste facilities. Yet these same fluids (in diluted form) are allowed to be injected directly into or adjacent to USDWs. Under the Safe Drinking Water Act, hazardous wastes may not be injected into USDWs. Moreover, even if hazardous wastes are decharacterized (for example, diluted with water so that they are rendered non-hazardous), wastes must still be injected into a formation that is below the USDW. http://www.epa.gov/ogwdw/uic/pdfs/study_uic-class1_study_risks_class1.pdf Clearly, some hydraulic fracturing fluids contain chemicals deemed to be “hazardous wastes.” Even if these chemicals are diluted it is unconscionable that EPA is allowing these substances to be injected directly into underground sources of drinking water. Colborn and her co-authors summarized health effect information for 353 chemicals used to drill and fracture natural gas wells in the United States. Health effects were broken into 12 categories: skin, eye and sensory organ, respiratory, gastrointestinal and liver, brain and nervous system, immune, kidney, cardiovascular and blood, cancer, mutagenic, endocrine disruption, other, and ecological effects. 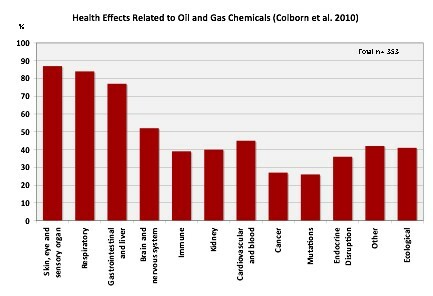 The chart below illustrates the possible health effects associated with the 353 natural gas-related chemicals for which Colborn and her co-authors were able to gather health-effects data. Spills of fracturing chemicals and wastes during transportation, fracturing operations and waste disposal have contaminated soil and surface waters. This section provides a few examples of spills related to hydraulic fracturing that have led to environmental impacts. Two spills kill fish: In September 2009, Cabot Oil and Gas spilled hydraulic fracturing fluid gel LGC-35 twice at the company’s Heitsman gas well. The two incidents released a total of 8,000 gallons of the fracturing fluid, polluting Stevens Creek and resulting in a fish kill. LGC-35, a well lubricant used during the fracturing process. 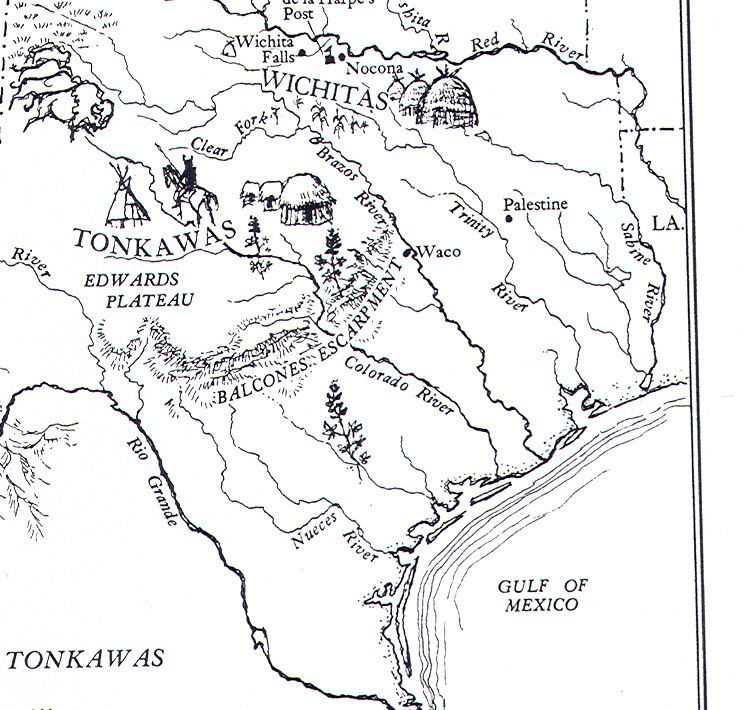 A third spill of LGC-35 occurred a week later, but did not enter the creek. http://www.portal.state.pa.us/portal/server.pt/community/newsroom/14287?id=13595&typeid=1 Fracturing fluid taints a high quality watershed: In December 2009, a wastewater pit overflowed at Atlas Resources’ Cowden 17 gas well, and an unknown quantity of hydraulic fracturing fluid wastes entered Dunkle Run, a “high quality watershed”. The company failed to report the spill. he chart below is a reproduction of the data from the EPA draft study. As seen in the chart, chemicals may be injected at concentrations that are anywhere from 4 to almost 13,000 times the acceptable concentration in drinking water. Not only does the injection of these chemicals pose a short-term threat to drinking water quality, it is quite possible that there could be long-term negative consequences for USDWs from these fracturing fluids. According to the EPA study, studies conducted by the oil and gas industry, and interviews with industry and regulators, 20 to 85% of fracturing fluids may remain in the formation, which means the fluids could continue to be a source of groundwater contamination for years to come. https://www.propublica.org/article/new-gas-wells-leave-more-chemicals-in-ground-hydraulic-fracturing The potential long-term consequences of dewatering and hydraulic fracturing on water resources have been summed up by professional hydrogeologist who spent 32 years with the U.S. Geological Survey: http://www.earthworksaction.org/library/detail/expert_testimony_on_hydraulic_fracturing_impacts/#.Ua4ty5yUDgw As mentioned previously, anywhere from 20-85% of fracking fluids remain in the ground. Some fracturing gels remain stranded in the formation, even when companies have tried to flush out the gels using water and strong acids. In many oil and gas producing regions, there has been a degradation of air quality as drilling increases. For example, in Texas, high levels of benzene have been measured in the air near wells in the Barnett Shale gas fields. These volatile air toxics may be originating from a variety of gas-field source such as separators, dehydrators, condensers, compressors, chemical spills, and leaking pipes and valves. Increasingly, research is being conducted on the potential air emissions released during the fracturing flow back stage, when wastewater returns to the surface. Shales contain numerous organic hydrocarbons, and additional chemicals are injected underground during shale gas drilling, well stimulation (e.g., hydraulic fracturing), and well workovers. The Pittsburgh University Center for Healthy Environments and Communities (CHEC) has been examining how organic compounds in the shale can be mobilized during fracturing and gas extraction processes. According to the CHEC researchers, these organic compounds are brought to the surface in the fracturing flowback or produced water, and often go into open impoundments (frac ponds), where the waste water, “will offgas its organic compounds into the air. This becomes an air pollution problem, and the organic compounds are now termed Hazardous Air Pollutants (HAP’s).” http://www.fractracker.org/2010/08/potential-shale-gas-extraction-air-pollution-impacts/ The initial draft of the New York draft supplemental environmental impacts statement related to drilling in the Marcellus Shale (which is no longer available on-line) included information on modeling of potential air impacts from fracturing fluid wastes stored in centralized impoundments. New York’s air modeling further suggested that the emission of Hazardous Air Pollutants (HAPs) from centralized flowback impoundments could exceed ambient air thresholds 1,000 meters (3,300 feet) from the impoundment, and could cause the impoundment to qualify as a major source of HAPs. Methanol is just one of the VOCs contained in flowback water. The combined emissions from all VOCs present in flowback stored at centralized impoundments could be very large, depending on the composition of the fracturing fluids used at the wells. Citizens of the gas field are experiencing health effects related to volatile chemicals from pits. In 2005, numerous Colorado residents experienced severe odors and health impacts related to flowback and drilling pits and tanks in Garfield County. According to Dion and Debbie Enlow complained to the Colorado Oil and Gas Conservation Commission about odors from a Barrett wellpad upwind from their home. The pad had four wells that were undergoing completion/hydraulic fracturing. Dion Enlow complained to the company that the smell was so bad that “I can’t go outside and breathe.” In Pennsylvania, a fracturing flowback wastewater pit just beyond June Chappel’s property line created odors similar to gasoline and kerosene, which forced her inside, left a greasy film on her windows, on one occasion created a white dust that fell over her yard. Chappel and her neighbors lived with the noxious odors until they hired an attorney and Range Resources agreed to remove the impoundment. Drinking water treatment facilities in Pennsylvania are not equipped to treat and remove many flowback contaminants, but rather, rely on dilution of chlorides, sulfates and other chemicals in surface waters used for drinking water supplies. http://www.portal.state.pa.us/portal/server.pt/community/newsroom/14287?id=13775&typeid=1 During the fall of 2008, the disposal of large volumes of flowback and produced water at publicly owned treatment works (POTWs) contributed to high total dissolved solids (TDS) levels measured in Pennsylvania’s Monongahela River and its tributaries:http://www.netl.doe.gov/technologies/oil-gas/Petroleum/projects/Environmental/Produced_Water/00975_MarcellusFlowback.html Studies showed that in addition to the Monongahela River, many of the other rivers and streams in Pennsylvania had a very limited ability to assimilate additional TDS, sulfate and chlorides, and that the high concentrations of these constituents were harming aquatic communities. Research by Carnegie Mellon University and Pittsburgh Water and Sewer Authority experts suggests that the natural gas industry has contributed to elevated levels of bromide in the Allegheny and Beaver Rivers. Bromides react with disinfectants used by municipal treatment plants to create brominated trihalomethanes, which have been linked to several types of cancer and birth defects. http://www.post-gazette.com/stories/local/breaking/pa-marcellus-wastewater-shouldnt-go-to-treatment-plants-294068/#ixzz1b9rPzTqm In August of 2010, Pennsylvania enacted new rules limiting the discharge of wastewater from gas drilling to 500 milligrams per liter of total dissolved solids (TDS) and 250 milligrams per liter for chlorides. The number of municipal facilities allowed to take drilling and fracking wastewater has dropped from 27 in 2010 to 15 in 2011. Disposal of drilling and fracking waste water is going to continue to present a challenge to local and state governments as more wells are developed across the country. In the mid-2000s, the Oil and Gas Accountability Project and The Endocrine Disruption Exchange (TEDX) began to compile information on drilling and fracturing chemicals from a number of sources, including Material Safety Data Sheets obtained through Freedom of Information Act requests of state agencies. http://www.endocrinedisruption.com/chemicals.introduction.php TEDX subsequently produced reports on the toxic chemicals used in oil and gas development in several western states including Montana, New Mexico, Wyoming and Colorado, and worked with the Environmental Working Group to produce a report on chemicals injected into oil and gas wells in Colorado. In 2006, the first effort to require disclosure of chemicals was launched. In June of 2006, the Oil and Gas Accountability Project submitted a letter to the Colorado Oil and Gas Conservation Commission (COGCC) and the Colorado Department of Public Health and the Environment (CDPHE) on behalf of five citizens organizations in Colorado. The groups asked that state agencies require disclosure of the chemicals used and monitoring of chemicals and wastes released by the oil and gas industry in Colorado. Since that time the Oil and Gas Accountability Project and others have worked to get disclosure bills passed in states across the country. Wyoming, Arkansas, Pennsylvania, Michigan and Texas now require a certain level of disclosure, although trade secret laws still prevent full disclosure in most states. 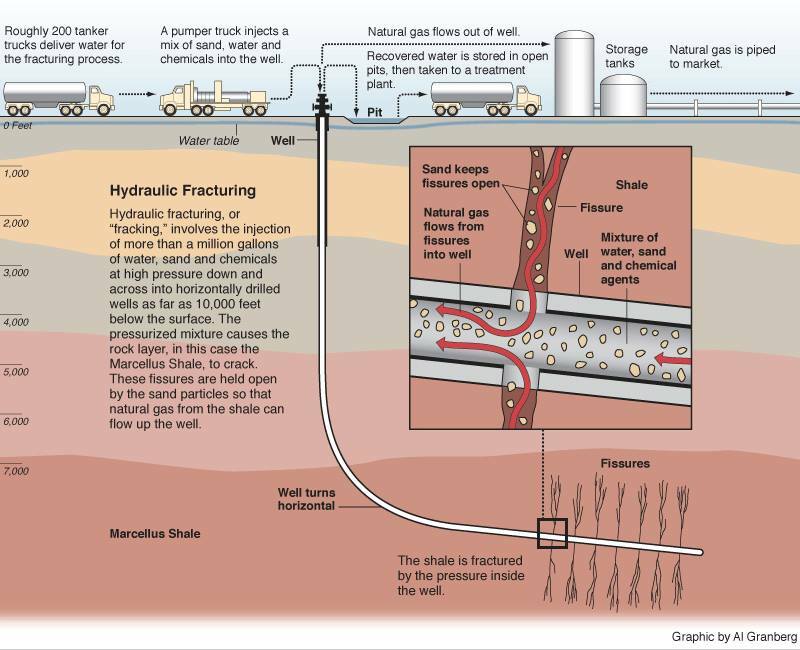 From a public health perspective, if hydraulic fracturing stimulation takes place, the best option is to fracture formations using sand and water without any additives, or sand and water with non-toxic additives. From a biosystems perspective, there is nothing non-toxic going on with fracking, even if so-called “non-toxic” additives, such as used by the offshore oil and gas industry, were to be implemented. It is common to use diesel in hydraulic fracturing fluids – diesel contains the carcinogen benzene, as well as other harmful chemicals such as naphthalene, toluene, ethylbenzene and xylene. According to the company Halliburton, “Diesel does not enhance the efficiency of the fracturing fluid; it is merely a component of the delivery system.” It is technologically feasible to replace diesel with non-toxic “delivery systems,” such as plain water. According to the EPA, “Water-based alternatives exist and from an environmental perspective, these water-based products are preferable.” But groundwater & aquifer depletion being the problem that they currently are, across the globe, using more water for fracking is no solution. Oil and gas wastes are often flowed back to and stored in pits on the surface. Often these pits are unlined. But even if they are lined, the liners can tear and contaminate soil and possibly groundwater with toxic chemicals. As mentioned above, toxic chemicals are used during hydraulic fracturing operations. The same chemicals that are injected come back to the surface in the flowed-back wastes. Obtaining fracking chemical information: The law requires that all employees have access to a Material Safety Data Sheet (MSDS), which contains information on health hazards, chemical ingredients, physical characteristics, control measures, and special handling procedures for all hazardous substances in the work area. The MSDSs are produced and distributed by the chemical manufacturers and distributors. It should be noted that MSDSs may not list all of the chemicals or chemical constituents being used (if they are trade secrets). Landowners may be able to obtain copies of MSDSs from company employees, the chemical manufacturers, or possibly from state agency representatives. Hazen and Sawyer, December 22, 2009. Impact Assessment of Natural Gas Production in the New York City Water Supply Watershed. p.5. In October of 2004, OGAP filed a Freedom of Information Act request with EPA to obtain the Material Safety Data Sheets (MSDS) supplied to the agency by hydraulic fracturing companies. (Freedom of Information Act, 5 U.S.C. 552, Request Number HQ-RIN-00044-05). The information in this table were contained in MSDS sheets from Schlumberger. The Frac Focus web site does not allow users to link to lists of chemicals published for individual well sites. To view data on the Bakken Shale wells, go to FracFocus web site and Search: North Dakota. Dunn County. Marathon. Edward Darwin #14-35H. Fracture Date: 7/14/2011; and Search: North Dakota. Dunn County. ConocoPhillips. Intervale 31-35H well. Fracture Date: 8/9/2011.